Wayne Robinson was born in Hamilton in 1947 and has lived here ever since. Wayne joined Hamilton Hydro in 1970, working as a Line Man. In 1975, he moved to The Hamilton Street Railway and finally in 1979 he was hired at K-Line where he remained until he had an accident in 1985. It was at this point that Wayne decided to work for himself. He became a very successful entrepreneur, owning several different businesses over the years. Now happily retired, Wayne spends time socializing with his many friends. Wayne and his wife Debbie have been together for 30 years. He has two adult daughters, Melanie and Leah. His daughters and their husbands have blessed Wayne and Debbie with four grandchildren – three grandsons and one granddaughter. Wayne’s Masonic career began in 1994 when he was initiated into Westmount Lodge No. 671. He was installed as the W. M. for the 1999 - 2000 term and served a second term in 2001 - 2002. Wayne was Westmount Lodge’s Officer of Instruction for many years. In 1995 Wayne affiliated with Centennial Daylight Lodge No. 679 and was the W. M. for two years, 2005 - 2006 and 2008 - 2009. He is also an affiliated member of Tuscan Lodge No. 551. Wayne is a 32nd Degree Scottish Rite Mason, a member of the Knights Templar in the York Rite and a member of the Noble Mystic Shrine of Hamilton. At the District level, Wayne has served as the Chairman of the Lodge Resources Committee, the Benevolence Committee, and the Masonic Education Committee and served on the Regalia Committee. Wayne expresses his thanks and gratitude to the brethren of Hamilton District C for the support and confidence placed in him to serve as their D. D. G. M. for 2012 - 2013. Wayne looks forward to working with our Grand Master, the M.W. Bro. D. Garry Dowling, and the Deputy Grand Master, the R. W. Bro. 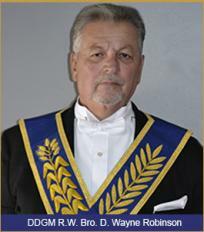 Donald A. Campbell, on behalf of the brethren of Hamilton Masonic District C.